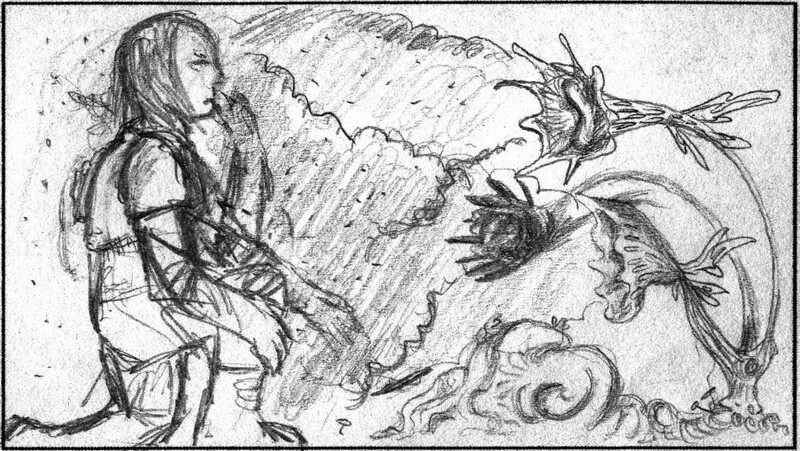 If you’d like to see the development of the story, you can do it by seeing the earlier storyboards. I don’t think I will publish earlier drafts of the script. Storyboard 1.0 – The first storyboard. Before re-done by Frode Munkhaugen, the designer. Storyboard 2.0 – The second version is Frode Munkhaugen’s design over the same story. Biggest difference besides that is that the maincharacter now is a woman. Storyboard 3.0 – The third version is a more complete and complex version of the story, with a lot of new elements and changes. Done by me as rough references to Frode mostly, but its fun to see how I pictured it first. 4.0 is his redesign of this again. Storyboard 4.0 – The fourth version, where Frode redesigned the 3.0. Great drawings. Too bad the format and storyboard program doesn’t do it justice. A improved version is in the works. Storyboard 5.0 – Is in the works. Its mostly a an improvement of the fourth because Celtx, the program used for it stretches the pictures, there also will be some update in the text.